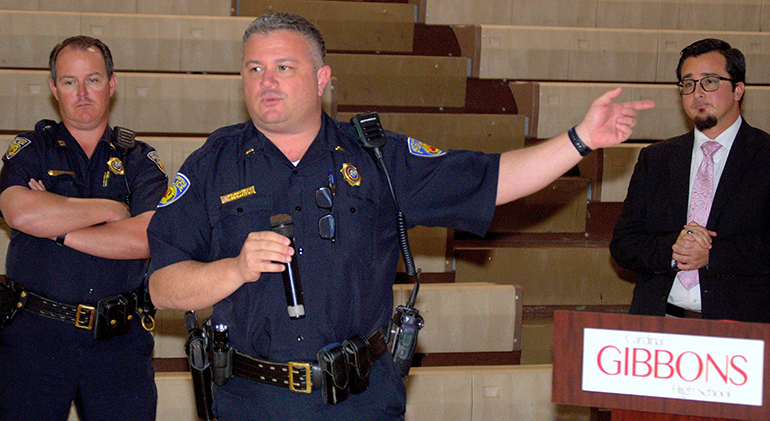 Lt. Charlie Studders of the Fort Lauderdale Police Department, center, speaks during a session on coping with active shooter situations at Cardinal Gibbons High School. Listening are FLPD Captain Patrick Hart, left, and Assistant Principal Oscar Cedeño of Gibbons. FORT LAUDERDALE | The attractive young woman spoke calmly about the day she was shot three times. “It took 11 and a half minutes … the longest minutes of my life,” said Kristina Anderson, who survived the attack that took 32 lives at Virginia Tech in 2007. 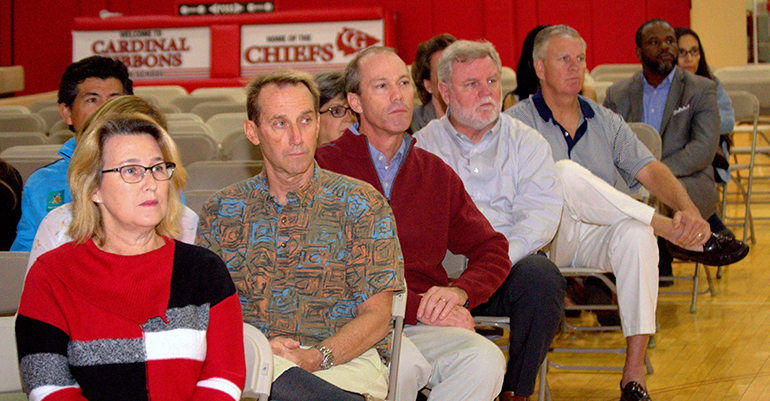 The 150 parents and a few students, in the gym at Cardinal Gibbons High School, listened to her video with barely a word. In a time of frequent mass shootings, they were learning how to live literally under the gun. 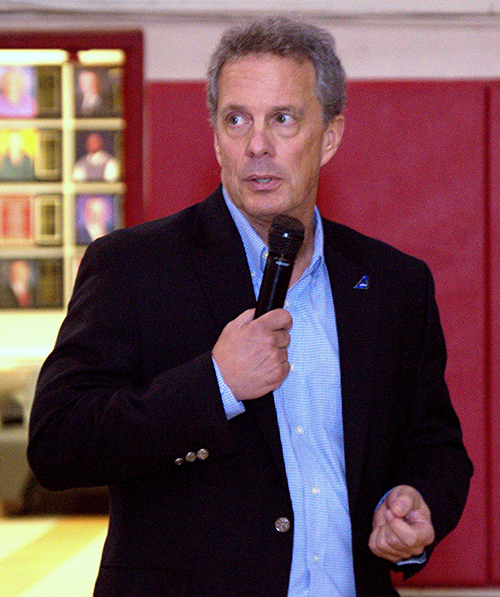 The Jan. 23 gathering was the joint work of Gibbons, the Fort Lauderdale Police Department and JetBlue airlines. The goal of the event was to equip school families for conversations with their children on how to cope during school shootings —tragedies like the shooting in February 2018 that killed 17 students and staff at Marjory Stoneman Douglas High School in Parkland. “You never expect these things, but you have to prepare,” said Garnett Byrd, a father of two. Keith Slotter, vice president of security at JetBlue, said the original program was developed five years ago for its program to counter workplace violence. But the airline began considering adapting it for schools as requests began coming in. The process was ramped up after the Parkland shooting, he said. Kristina Anderson, a survivor of the 2007 shootings at Virginia Tech, speaks via video during a session on coping with active shooter situations at Cardinal Gibbons High School. 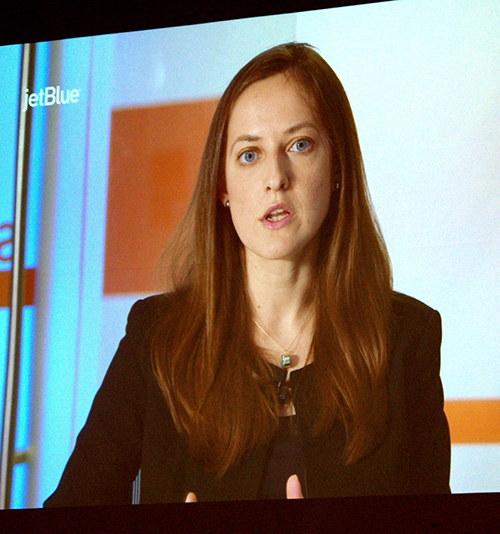 Keith Slotter, vice president of security for JetBlue, says the airline adapted a video on shooting incidents from its program to counter violence in the workplace. Detective Carmelo Colon of the Fort Lauderdale Police Department praises Cardinal Gibbons High for its measures to prevent school shootings. Christina Rodrigues tells assistant principal Oscar Cedeño about a mothers’ group for gun control during a session on coping with active shooter situations at Cardinal Gibbons High School. Shooters seldom act on impulse. They plan their attacks well. A third of them tend to “react explosively and violently” to perceived injustices against them. They show interest in weapons and research previous shooting incidents. They often tell others what they want to do, furnishing a chance to stop the crimes before they start. The presentation offered other advice, including the now-familiar common wisdom of “Run, Hide, Fight”: Flee or evade an attacker if possible. But if fighting is unavoidable, commit yourself fully. Wherever you are, notice the two nearest exits. And report any strange or unusual activity. During an incident, push chairs and tables against a classroom door. Shooters know they have only a few minutes until police show up. If you can escape, tell others, then get out. Don’t wait for others to follow. Police won't stop to treat injuries. A medical team will arrive after the shooter is stopped. Anderson added that good relationships with adults can foster students’ resilience and speed their recovery after a shooting. “Victim recovery is a marathon, not a sprint,” said Anderson, who took a year to recover from her wounds. Assistant Principal Oscar Cedeño, who emceed the Gibbons program, noted that many of the tips could be applied elsewhere, like a mall or a concert. 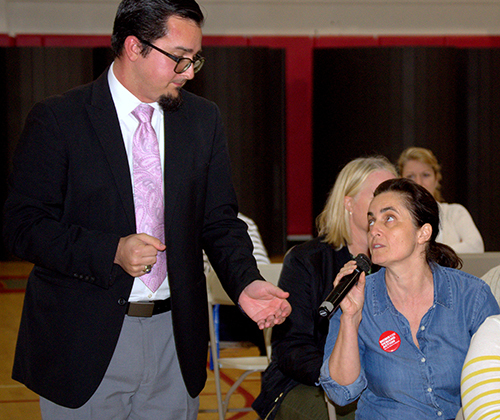 “This is not just a high school or middle school issue —it’s an everywhere issue,” Cedeño told the crowd. He didn’t offer evidence, but the week’s news supplied it. Hours before, a man entered a bank in Sebring and shot five women dead. The following weekend saw shootings with multiple victims each in Louisiana, Delaware and Pennsylvania. In the video, Anderson’s delivery was mostly quiet and matter-of-fact. But she spoke vehemently about what she saw as excess media attention to the shooters. “[News reports] should highlight attention for the victims and the first responders, not the shooters,” she said. The Jan. 23 session overlapped the theme of the archdiocese’s traditional back-to-school conference on Aug. 15, which included FBI seminars on how to handle “active shooter” situations. But Gibbons High has a long history of preparing for the worst. For decades, the school has served as a training ground for Fort Lauderdale police, such as SWAT teams and K-9 police dogs. In August, its teachers even took part in an active shooter drill, with police officers firing shotgun rounds at the ceiling. 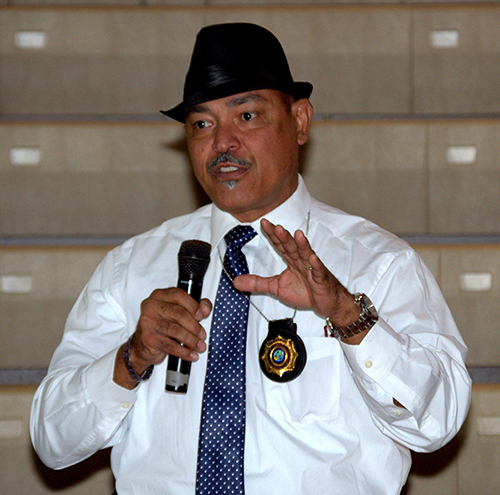 Detective Carmelo Colon, who has been with FLPD for 29 years, praised the school for being intent on preparations. “I wish we had such good relations with every school,” he said. Lt. Charlie Studders of the Fort Lauderdale Police Department sought to add a note of hope to the night’s grim topic. He said he asked a class of young police officers what it meant to “go postal.” None knew. Some in the audience clearly were sold before coming that night. Kenton and Christine Hajdic said they’ve already taught their two children “situational awareness” — noting who else is in a room and where the exits are. Christina Rodrigues said she joined a national group called Moms Demand Action after her two children showed her a video from the shootings at Marjorie Stoneman Douglas. She said she plans to join about 400 others of the group in Tallahassee on Feb. 6 to pressure legislators for tighter gun laws. Students, too, gave a thumbs-up to the presentation. They were struck by Kristina Anderson’s testimony — how she kept her head amid danger to her life. Encouraged by the turnout at this initial event, Gibbons’ leaders have already announced their next “Conversation” topic: vaping, or smoking with electronic “cigarettes.” Many teenagers think it’s harmless, but the device often delivers more nicotine than regular cigarettes. It can also be loaded with THC, the main ingredient in marijuana. “It’s rampant, especially in middle schools,” Cedeño said of vaping. The event is scheduled for April. The school is also considering another active shooter presentation, this one for the student body. Parents hear police and school officials on coping with active shooter situations at Cardinal Gibbons High School.